Though St. George's Cross is not always displayed on the flag of New England, the depiction of a Pine almost always is. There exists both a blue ensign and red ensign variant. In each there is a St. George's cross in the canton, whose top left corner is defaced with an image of a pine. Sometimes the blue ensign is defaced with six stars in a circle symbolizing the six states of New England. In another variant, such as used by the New England Independence Movement and the New England Revolution, is a red ensign with an image of a Pine tree over a white field appears in the canton, and contains no cross. The red ensign was a common banner for other North American colonies as well, however the addition of a Pine tree is what was used to distinguish the New England colonies from its neighbors. Most New England flags were based on the blue or red naval ensign of the Royal Navy which featured St George's Cross in the canton, which was used at both Jamestown, Virginia and Plymouth colony. Puritans in New England led by Roger Williams objected to the use of a Christian cross on their flag, and they flew a red flag with a plain white canton for a time. The new flag first appeared in 1634 in Salem, Massachusetts, but some considered it to be an act of rebellion against England and the cross was retained on crown property such as Castle Island (Massachusetts). The crossless flags became popular in New England, and militia companies designed unique patterns on their flags. In 1665, the Royal Commissioners recommended that all ships and militia companies be ordered to fly "the true colours of England, by which they may be knowne to be his majesties legittmate subjects." Nevertheless, some crossless flags were still in use as late as 1680, and New Englanders continued to look for ways to represent their country. In 1684, the town of Newbury, Massachusetts changed to a green flag, though retaining the Cross of St. George. A pine tree was added to some flags during the reign of King James II, possibly inspired by the pine-tree shilling which was minted in Massachusetts. In 1707, a proclamation was issued that all merchant vessels fly the red ensign with the British Union Flag in the canton, and a woodcut was published in the Boston News-Letter on 26 January 1707 to ensure compliance, which was also the first illustration printed in an American newspaper. Some controversy exists concerning which flag flew at the Battle of Bunker Hill in 1775 at the onset of the American Revolutionary War. An officer of the Royal Marines reported that no flags were used by the Americans, but John Trumbull placed a red flag with a pine tree in his 1786 painting The Death of General Warren at the Battle of Bunker's Hill, June 17, 1775. However, he later painted another version of this painting for the family of the fallen general which depicts a blue flag. Another variation commonly used to represent the battle has a blue field with a white canton, the canton quartered with St. George's Cross and a tree. According to author Boleslaw Mastai, the blue field was due to an error in a wood engraving which caused confusion among painters. The printing error might have been caused by incorrect "hatching", whereby parallel lines represent heraldic tinctures or colors; horizontal lines represent blue and vertical ones represent red. However, Benson John Lossing writes in Field Book of the Revolution that he interviewed the daughter of a Bunker Hill veteran who told her that he hoisted a blue flag on Breed's Hill prior to the battle. Regardless of its authenticity, the blue variation has become a symbol of the Battle of Bunker Hill and also of Charlestown, Boston, the neighborhood encompassing Bunker and Breed's hills. It was also featured on a 1968 US Postage Stamp. The naval Red Ensign of the former Kingdom of England from which the flags of New England are derived. An early flag of the Massachusetts Bay Colony with the St George's cross of England removed. Naval Jack drawn by John Graydon in 1686, consisting of St George's cross with a pine tree in the canton. The First Flag (and Ensign) of New England, used by Colonial merchant ships sailing out of New England ports, 1686-c.1737. The Flag of New England during the Revolutionary War. It was depicted by John Trumbull in The Death of General Warren at the Battle of Bunker's Hill, June 17, 1775. This flag has also been adopted by the New England Revolution Major League Soccer team, The New England Independence Campaign, and Lincoln County, Maine. The blue Bunker Hill Flag. As noted above, the blue field may be the result of an error in a wood engraving; the actual "Bunker Hill Flag" may have been the flag captioned "The Flag of New England during the Revolutionary War," also pictured here. 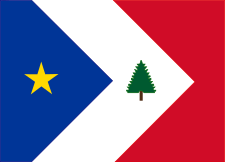 In 1998, Mr. Ebinger appeared before the New England Governors' Conference, in Fredericton, New Brunswick, Canada during the annual Conference of New England Governors and Eastern Canadian Premiers and suggested [that] the promotion of New England tourism would benefit from the use of a common symbol, such as his "New England Flag". At that meeting, the governors approved a motion to adopt the flag as the "official emblem of the New England Conference". They did not make any claims as to its legitimacy as an official or authentic flag of the six state region, nor did they adopt it as the official flag of the region. ^ "The Death of General Warren at the Battle of Bunker's Hill". americanrevolution.org. Retrieved 13 March 2015. ^ "Boston Museum of Fine Arts - The Death of General Warren at the Battle of Bunker's Hill, 17 June, 1775". mfa.org. Retrieved 2 January 2015. ^ "heraldic hatching - Google Search". www.google.com. Retrieved 25 November 2018. ^ Edward O’Connor. "Alternate flags for New England". E. O’Connor. Retrieved 2008-01-29. ^ a b David B. Martucci. "The New England Flag". D. Martucci. Archived from the original on April 1, 2007. Retrieved 2008-07-25. ^ a b 'Historical Flags of Our Ancestors'. "Flags of the Early North American Colonies and Explorers". Loeser.is. Retrieved 30 October 2014. ^ "New England flags (U.S.)". Crwflags.com. Retrieved 2008-11-07. ^ "New England flags (U.S.)". fotw.info. Retrieved 25 November 2018. ^ "The Flag of New England Page". Midcoast.com. Archived from the original on April 1, 2007. Retrieved 30 October 2014. ^ "The New England Flag by David B. Martucci". Archived from the original on April 1, 2007. Retrieved 14 March 2015. Furlong, William Rea; McCandless, Byron (1981). So Proudly We Hail : The History of the United States Flag. Washington, D.C.: Smithsonian Institution Press. ISBN 978-0-87474-448-4. Lossing, Benson J. (1850). Pictorial Field Book of the Revolution. Mastai, Boleslaw; Mastai, Marie-Louise D'Otrange (1973). The Stars and the Stripes. The American Flag as Art and as History from the Birth of the Republic to the Present. New York: Alfred A. Knopf. ISBN 978-0-394-47217-1.